First, ensure that all doors, windows and cat flaps are secure, and any hazards are removed, such as sharp objects. If you have a fireplace make sure that it is blocked off - cats can easily climb up inside a chimney! Dedicate a quiet room in which your new cat can spend its first few days, to settle into their new home. This will allow your cat time to get used the sounds and smell of your home, whilst not feeling overwhelmed. Your cat will need a litter tray (with litter), a food and water bowl and good quality food. They will also need a bed and a place to hide just in case they're a bit shy at first; an upside down cardboard box with a door cut into it is ideal - just remember to place a cosy folded blanket underneath. You also need to provide a scratching post and some toys so your new cat doesn't get bored. When you get your cat home, take it to its dedicated room, open the carrier and allow your cat to come out when (s)he is ready. Be patient, this may take a little time, after all, your home will be a strange environment for your new cat. Leave your cat alone to explore their room for an hour or so. When your are in their room, always let them come to you and if your cat hides, just sit with them and talk gently, offering encouragement. Please don't force them to come out of their hiding place - it's perfectly natural for a cat to hide away at first until they get used to their new home. Just give them plenty of time and they will soon feel at home. We strongly recommend that you keep your cat indoors for the first 4 weeks although some cats may need longer. It is important to give your cat enough time indoors, as your cat may run away if you let them out during this settling in period. Please remember to keep doors, windows, cat flaps (and open fire places) closed. Kittens must be kept indoors until they are neutered. We recommend that you get your cat used to a particular call at mealtimes - cats respond best to a higher pitched voice so bear this in mind when you call them. Before letting your cat out for the first time (after the 4 week settling in period), make sure that your cat is hungry (i.e. let them out around 30 minutes before their mealtime) and that it is daylight. Leave the door open and let your cat outside; it is a good idea to supervise their first few outings, then after they have explored for a while call them in for their meal. By doing this, your cat will associate your home with food, and will help ensure they come back when called. We recommend that you keep your cat indoors at night time - this will help prevent them getting into fights and avoid road accidents, both of which tend to occur mostly after dark. 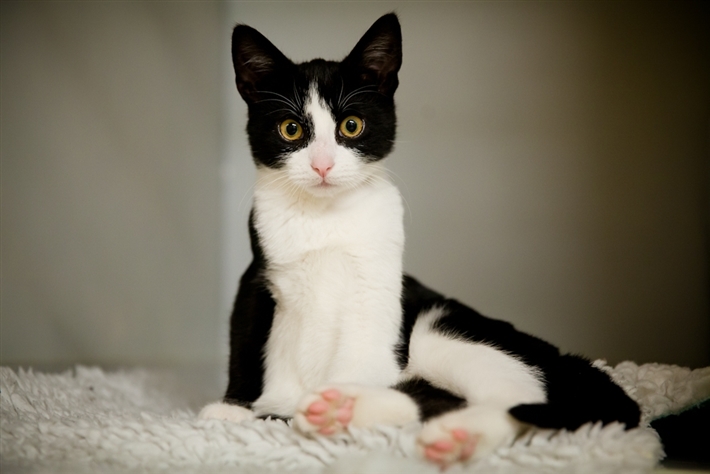 It's our policy that kittens must be neutered from 4 months old (though some vets may do it at an earlier age - this doesn't affect the kitten in any way, apart from not being able to reproduce of course!). Female cats are able to produce kittens at 3-4 months old, un-neutered males will roam (and possibly end up straying), fight other males, and produce the distinctive tom cat smell – plenty of good reasons to give him the snip! A proof of neutering certificate (signed and stamped by your vet) must be returned to us once your kitten is neutered. We will send you reminders if we haven't received the proof of neutering certificate from you. Always provide clean, fresh water for your cat at all times. We recommend a good quality diet for your new cat, as cat nutrition and health are related. If you provide wet food (i.e. pouches or tins), as well as dry food, your cat will get additional water from this food, which can benefit them as cats don't drink as much as they should - in the wild, cats get most of their water from their prey. Please buy the best food you can afford and check the label to see what the food actually contains. Animal protein is the most important ingredient - the higher the percentage, the better quality the food will be (10% and above is considered to be high quality). If you want to change your cat's food, do so over a period of days to prevent an upset stomach. Avoid food that contains lots of plant-based ingredients or carbohydrates (rice, wheat, potatoes, sugar or any other grain etc.) as cats cannot digest plant matter, and it brings them no nutritional benefits. A litter tray must be available at all times even if your cat goes outside. If you wish your cat to wear a collar, only use a snap-release safety collar, to avoid your get getting its collar caught on things. Make sure your cat receives regular flea and worming treatments, which your vet will be able to provide advice on. Flea treatment needs to be provided monthly and worming treatment needs to be provided every three months. Your cat will have been vaccinated by us but they will need a yearly booster vaccination - to prevent diseases, some of which are fatal, and, if you have insured your cat, your chosen insurer will make vaccinations a condition of the policy. You will get 4 weeks free PetPlan insurance with your new cat. The excess on your free cover is £85 (this is only payable if you make a claim against the policy). We recommend that you insure your cat after this free cover ends as unexpected vet bills can be costly. Did you know, you are more likely to claim on your pet insurance than you are on your home or car insurance? (according to Allianz). If you continue the policy with Petplan, 10% of your premiums will be donated back to Cats Protection to allow us to continue helping more cats.